If you watched PBS in the 1980s, you may already be familiar with the work of Mel Bartholomew, a retired engineer and the father of square foot gardening. Square foot gardening is a simple, mathematical gardening method using shallow raised beds and a specialized growing medium. In 1981, Bartholomew published the first edition of his book “Square Foot Gardening.” Over the course of his decades long career, Bartholomew published nearly a dozen books and hosted the “Square Foot Gardening” television series starting in 1982. Bartholomew passed away in 2016, but his son Steve Bartholomew and Steve’s wife Laura Bartholomew continue to run the Square Foot Gardening Foundation in Halesite, New York. The best way to start with square foot gardening is to purchase Mel Bartholomew’s book, which is said to be the best-selling gardening book of all time. The third and latest edition of “All New Square Foot Gardening” was published in November 2018 by Quarto, but Steve and Laura Bartholomew said the books are also readily available at many local libraries. To start square foot gardening, you first need to build a raised garden bed that is six inches deep. You can make your bed out of recycled materials, but Steve and Laura Bartholomew recommended avoiding cinder, cement or any materials that may leach into your garden. “There seems to be a fad of reusing tires and stuff like that,” Laura Bartholomew said. Then, prepare Mel’s Mix, a growing medium made of equal parts vermiculite, compost and peat moss, to fill the bed. The soil, which Laura Bartholomew is “probably the most expensive part of starting a square foot garden,” is essential to the garden’s success because it retains moisture, drains well and is rich in nutrients. Finally, divide the plot into one foot by one foot squares using a grid made of wood laths, blinds scrap wood strips or even string for a subtler grid. Mel Bartholomew’s original square foot garden was a four foot by four foot square, but the garden can be any size, as long as the width does not exceed four feet. “That number is based on experimenting with children and older people for reach,” Laura Bartholomew said. “You always want to be able to reach into your garden. Each square can hold a certain number of plants based on Mel Bartholomew’s “1-4-9-16 rule” based on how much room the plant needs to grow. Wily, winding tomato vines, for example, need one square each, whereas sixteen compact little green onions can be planted in a single square. Once you build the box, it is possible to add trellises, hoop houses and other add-ons for the specific things you want to grow or to extend your season. “Depending on your [hardiness] zone, you can grow all year,” said Steve Bartholomew. 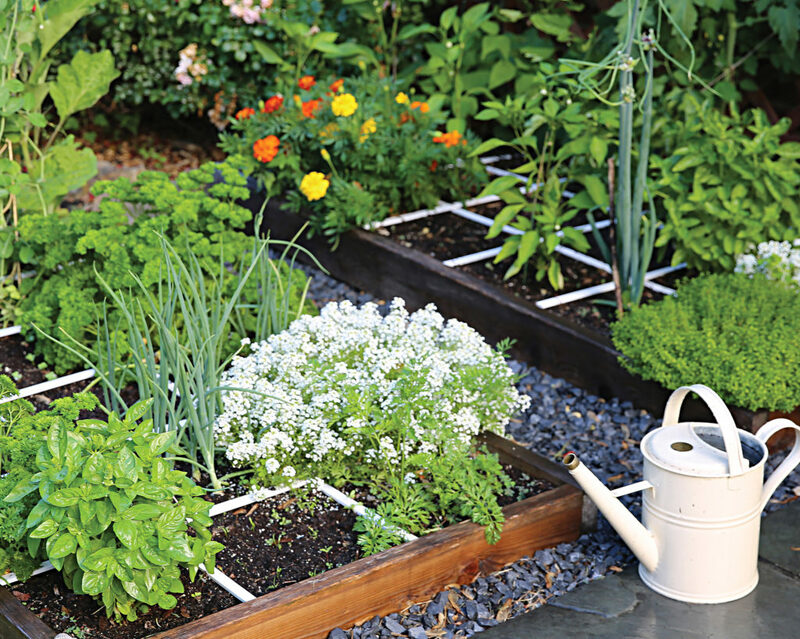 Square foot gardening is resource-efficient and works especially well for gardeners with small spaces. 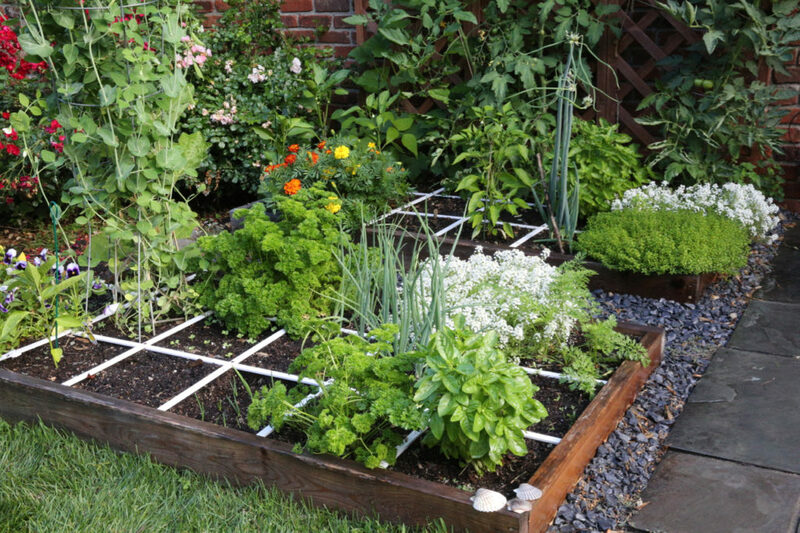 A square foot garden also requires less maintenance than traditional garden beds. Though beds require slightly more watering, the planting is so dense that weeds do not have room to grow, and because you never have to walk on the beds, the soil remains “friable,” or crumbly and soft. “Any weeds you get in the square foot garden you can pluck out with your fingers,” Steve Bartholomew explained. The soil also does not require tilling, just a topping off of compost from year to year (Laura Bartholomew said that homemade compost is always recommended). The nature of the soil and the technique can also extend your growing season. Square foot gardening is designed to be accessible to everyone. The simplicity of the method is helps break down the process for first-time gardeners. It is also great for children as a learning tool. “Because of the mathematical nature of it, it really lends itself to kids, especially kids that are homeschooling because there are a lot of lessons they can learn,” Laura Bartholomew said. Because of its design, square foot gardening is also particularly conducive for gardeners with disabilities or mobility issues. Brian Fuder, owner and founder at Square Foot Gardening for the Red River Valley, an organization providing gardening space and education about square foot gardening in Moorhead, Minnesota, designed a square foot gardening bed that is wheelchair-accessible by raising them three feet off the ground and shrinking the bed to make it easier to reach across from the seated position. The raised bed is also easy to access without bending over for older gardeners with mobility issues. The beds are now marketed with the Square Foot Gardening Foundation. Fuder, who believes strongly in the therapeutic benefits of gardening, donates beds to senior centers and veterans through the Semper Fi Fund. Some gardeners may feel confined by the limitations of square foot gardening. Taller plants that require more soil support may be challenging to grow in the six inches of allotted soil. Elevated beds also present a unique challenge of pests. There are different add-ons and attachments also help cope with these limitations. The “top hat” add-on can be placed on squares to add six more inches of growing depth for vegetables that need more downwards growing space. There are also additional protective add-ons to shield against pets. “You are able to adequately control pests by building small structures to keep out rabbits and deer,” Steve Bartholomew said. If you are just getting started with gardening, looking to grow more efficiently in small spaces or trying to get back into gardening after mobility challenges have kept your hands out of the dirt, though, experimenting with square foot gardening would be a great project for you this spring.